Revolving discards are used at a defender’s first opportunity to make a discard. A high spot card indicates suit preference for the next-higher available suit, while a low spot card indicates suit preference for the next-lower available suit. A low spade is suit-preference for hearts, the next-lower suit. A high spade is suit-preference for clubs, the “next-higher” suit. A low heart is suit-preference for clubs. You “skip” diamonds since you don’t have any! A high heart is suit-preference for spades. A low club is suit-preference for spades. A high club is suit-preference for hearts. Again, you “skip” the diamond suit. Revolving discards are very similar to Lavinthal Discards. The difference lies in the “revolving” approach, whereby a high spade encourages clubs and a low club encourages spades. In the above example, a low club when playing Lavinthal would be a signal for hearts, the lower of the two remaining suits (hearts and spades). 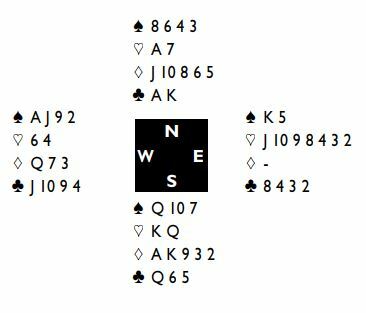 Here is a simple example of how they work: West leads the jack of clubs. When declarer starts on the diamonds,East discards the jack of hearts,suggesting he has something good in spades. The same principle works all the way round the suits, so a high spade would ask for a club,a high club for a diamond and so on. In its original version,the discard of a low card worked in the same way,a low spade asking for a heart etc. Some partnerships agreed that it only operates on the first discard.